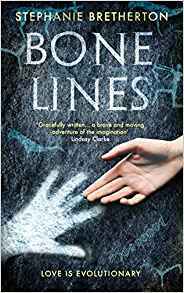 Stephanie Bretherton’s novel, Bone Lines, follows twin narratives of two strong female characters. Eloise is a successful archaeological anthropologist. She’s excitedly studying the skeletal remains of an ancient African. The parallel storyline is that of this woman 70 000 years ago. Struggling with a newborn baby, in a region desperately affected by a climatic event that has killed most of the animals and people, she travels through the wasting land in search of greener pastures. Both women struggle with the events surrounding them. Eloise has relationship issues, some of which relate to worries about getting old. Then there are the first world problems of being a modern academic scientist: worries relating to funding, professional rivalries and office politics. Getting mugged doesn’t help either. Eloise’s subject has the daily search to find food and she is constantly on watch to avoid predators, and other hominids, who might do them harm. Whilst this part of the story necessitated an invented Africa, it reads utterly believably. There were no moments where I even wondered, ‘is that actually what it would have been like?’. This is particularly strong, as the ancient protagonist is wandering a landscape where various human species are present at the same time, and when she encounters new people, there is the question of both what their tribe or clan is like and also what their species is like. Absolutely intriguing. It made me wonder what, for example, your pet cat would make of a meeting with a lion. The stories develop nicely, leading to sound and rounded conclusions for both women. As a scientist myself, I found a real delight in the intellectual strength of the writing. It was intriguing, with a disparate range of scientific ideas woven together really well. Even Eloise’s various men friends came across as both believable and interesting. And I say ‘even’, not because it surprises me that Bretherton could pull this off, but because I normally find the human relationship aspects of novels a real turn off. For me, the story has a great balance of scientific/plot interest against the human interest side of things.